This one-pan dinner requires little effort and just a bit of babysitting to put together. It's easily doubled but the onions will take a little longer to caramelize. 1) Add butter and olive oil to a large frying pan and set over medium heat. When bubbly, add onion. Cook, stirring occasionally, for 30 minutes. Add garlic cloves, cook an additional 10 minutes until they begin to caramelized. Meanwhile, slice pears into thin wedges and add into the caramelized onion & garlic cloves. Cook, stirring often, for 5 minutes until softened slightly. 2) Push to outer edges of pan. Add sausages to pan. 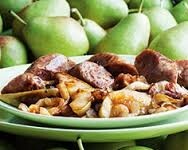 Cook, turning sausages and stirring onions, garlic cloves and pears for 15 to 20 minutes until sausages cook though and onion, garlic cloves and pears caramelized. Slice sausage if you desire. Serve with English mustard or Dijon.